About a year ago, I used the Way Back Machine/Archive.org to go back and examine the prices at conception of tea from western vendors since 2011. This was a valuable exercise and produced some interesting findings on a range of things, from price fluctuation, to the specific market each vendor aims for, etc. Crunching the numbers also statistically confirmed what many have long known. Fresh/young pu’erh prices have gone up in price by a whole lot in this decade.. I decided to update that post with teas that were added since. I added 55 spring productions in total, 51 productions from 2018 and 4 from Chawangshop’s 2017 (they were slow to add them to their site in 2017). 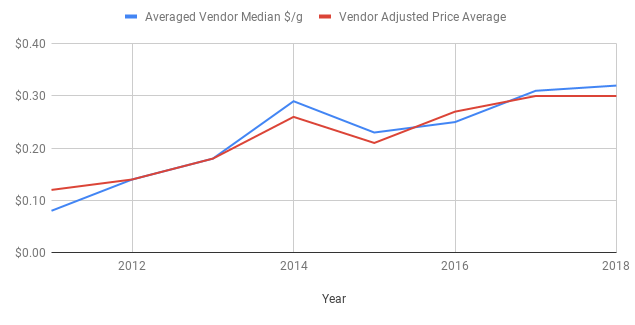 Median Vendor Price by Year. The good news is that the median prices from Yunnan Sourcing, White2Tea, and Crimson Lotus Tea remain virtually the same as 2017. The average vendor price of YS & W2T ticked up a smidgen.. When I originally did this exercise, five of the six previous years had higher prices than the last. In other words, in five out of six years there was a new record price for maocha. This makes the flat line between 2017 to 2018 somewhat encouraging. The bad news is that the prices from 2017 were the highest ever and if you were a consumer looking for any sort of price relief, you probably won’t find much in 2018 young tea. According to the vendor adjusted metric, there was an increase of ~175% for the median production from 2011-2018, approximately the same as 2011-2017. The average tea in 2018 would be a $107/357g bing, or if we’re being more realistic a $60/200g Xiaobing. This compares with a $24/200g or $43/357g bing that would’ve been the average of 2011. For the dataset I used the spring pu’erh productions from Chawangshop, Crimson Lotus Tea, Tea Urchin, White2Tea, and Yunnan Sourcing. These vendors have been pressing tea on their own label since at least 2014, with YS and CWS having pressed tea since 2011. The list is not totally complete and it is likely there are certain productions missing. There are also other productions where I couldn’t verify the release price. It’s a dataset that spans 353 productions over 8 years (2011-2018).. This table essentially shows which price range vendors tend to focus on. It also confirms what most people familiar with the pu’erh scene already know. W2T is the most active participant in the higher-end market (TU used to make more). Whereas YS is the most active in a wider range, including budget teas. The median YS tea (of 2011-2018) would be ~$0.14/g or $28/200g while the median W2T would be ~$0.41/g or $82/200g. As many of you know, I’m not an avid sampler or buyer of young pu’erh. It has been four years since I’ve made a cake purchases of a young tea. I simply get more enjoyment and in my opinion value with semi-aged and aged teas. If you’re unconvinced, it’s worth taking a look at the case I’ve made in the previous post about how semi-aged tea can represent superior value. This analysis is more or less an interesting exercise for me, and does not have direct purchasing implications. I do think it is worth noting that despite buying almost exclusively 10-20 year old tea my own average $/g purchase is lower than the median $107/357g cake. This average hovers between $0.20-$0.30/g (depending on how you do the math). Would I rather have these than the median 2018 (or 2019) sheng. Undoubtedly so. This entry was posted in Article, Raw Pu'erh and tagged Chawangshop, Crimson Lotus Tea, Tea Urchin, White2Tea, Yunnan Sourcing. Bookmark the permalink. Have you seen any indication that the trend in semi aged tea being a better value is beginning to change? As new cakes are (in my opinion) ridiculously priced these days … and have been for several years now, has there been a migration to these semi aged and aged teas? If so, I would assume that would begin to drive those prices up as well. Or, are more people just craving the new tea? If the latter, then maybe these semi aged teas remain a good value, otherwise I would get them while you can. Very often the semi-aged teas offered by these vendors are drinker quality at best, compared to their better quality young teas. Semi-aged of equal high quality is at least as expensive, if not more. Lesser quality and wet stored teas of course are worth less. Bottom line, for the best teas, expect the wallet to empty fast. Those are good questions and talking points. Frankly it’s hard to say. The western market is a microcosm of a microcosm of the Chinese market. I do think the better values of the semi-aged and aged market have gradually been bought out. That being said, with the way the maocha prices have risen teas from 2012, 2013, or even 2014 tea that have not risen in price are going to look more and more appealing. These teas are also on the verge of being called semi-aged now. So perhaps the value will just shift towards slightly newer semi-aged tea.. Maybe if the maocha prices hold steady for another couple years this will change. I think what Cwyn says is not necessarily wrong when it comes to buying from these specific vendors…. But I still do think the better deals are semi-aged teas that you can find from alternate sources (Emmett, TWL, LP, TW Auctions, taobao, etc.). To me the better options here are much more appealing than any of the young teas being offered here.